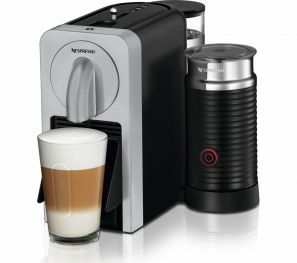 This machine will make your morning coffee for you, what more could you ask for! With built in Bluetooth and a simple app download you can manage you machine with a simple swipe. Keep an eye on your capsule stock, schedule a brew time, brew remotely, access machine assistance alerts and easily register your machine with the Nespresso Club. Brew a delicious cup of espresso based coffee or if desired an milky cappuccino or latte. Your frother you can create café-style coffee beverages right at home. Your drip tray is foldable and removable, you can use taller cups and glasses to suit the size of drink you're making. Choose between Ristretto, Espresso and Lungo black coffee sizes depending on whether you want a quick refresher or a longer drink to relax with. Automatic flow stop and no drip technology help to keep your countertop clean and dry. You'll be able to get descaling and maintenance alerts via the smart app, making it easier to maintain your coffee machine and keep on making drinks the way you like them. The Prodigio offers a compact design and rotating water tank to help it fit seamlessly into almost any kitchen layout.